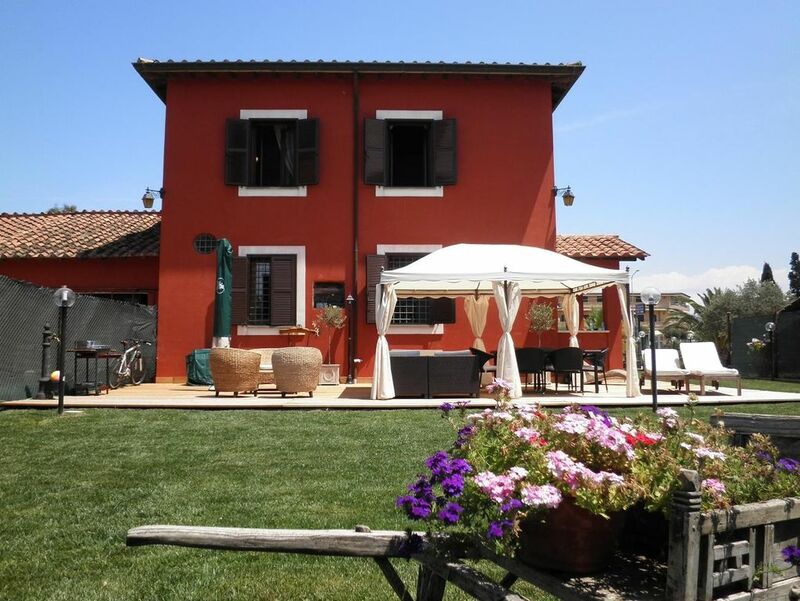 'Beautiful ancient farmhouse, charming residence, built in 1903 and renovated 5 years ago, once owned by the noble Torlonia family Sforza Cesarini. The villa is built on two levels above ground, for a total of 160 square meters and insists on a park of 2000 square meters; It has 4 bedrooms (including a lovely suite bathroom with tub and shower in the room) and 3 bathrooms, fully equipped kitchen, living room, outside the large patio decking with gazebo, sun beds, sofas, barbecue etc .. is surrounded by the green Roman countryside, 2 km from the wide, sandy beaches of the coast, 30 km from the center of Rome (possible transfers and excursions) and 10 km from the famous Castelli Romani (for lovers of food and wine tours). Casale Torlonia is ideal for those who want a beach holiday in an independent and prestigious, but affordable, remaining near the center of the main historical and archaeological sites of Rome. We signed an agreement with the nearby Golf Club Marediroma for entry to the swimming pool, gym, restaurant and of course the golf course with 2 lakes. This house in Ardea, is very nice, certainly for us. We where there with 6 adults and 4 younger childeren. Because the garden is fenced, that made the vacation very relaxed for us as parents! Ardea is a good place if you want to see more of the south of Italie (Anzio etc) and if you want to visit Rome. We also went to the area Castella Romani, you can visit a lot in about a 30 minutes drive. You will need a car. Ardea as a village is not a very touristic place. And also not a very beautiful one. They could pay more attention to waste beside the roads and at the beach. The advantage however is that the beach is very quit and it has nice sandy beaches. Also the prices for drinks are reasonable! Barbara as a host is very friendly, thank you! Many thanks for the appreciation on the house As far as the garbage that some people throw in some areas find it uncivilized, unfortunately, is a social problem in Italy, but the town of Ardea was one of the first in Italy to make the collection door to-door service is daily and on time. As for the illegal dumping, operators collect on time after each report of our citizens. I'm so sorry a out that, wish that Italians expecially the new generations will ne better. The house was marvellous, old and comfortably renovated, with taste and had modern facilities. Including also wifi. Also the kitchen was quite well equipped - it was a pleasure, and new to us to cook with gas. Having nice weather, we enjoyed the garden untill late evening. The parking area separated the busy street from the house and made it secure even to our small grandchildren. Though situated near the sea shore and Rome,you still need some kind of transportation, a car or bicycles, which were kindly provided, to reach the beach and train station, or even the supermarket. We were also delighted to find vegetable farmer next door. Great location 30 minutes driving from Rome, 1 mile away from the beach. Nice garden and terrace. Perfect family stay. A 1/2h de Rome et 2 minutes de la plage. Parfait pour familles. Beautiful house and amazing owner! As a family of 10 people we stayed in this beautifully decorated house in July 2014. It's spacious and very clean. It has a large garden, perfect for children. We loved our stay at this place and Barbara was simply wonderful. I would definitely recommend this house for your vacation, however you need a car for sure. Also the beach is beautiful. I'm glad you enjoyed the stay. The car was recommended to visit the beauties of this region especially for those who had so many children like your beautiful family! We had a wonderful time at the villa in June 2014! The charming old-fashioned design you can see in the pictures looks even more adorable and fresh in reality with every small detail thought out with loving care. The house is fully equipped with all the possible things you could require during the stay. The wi-fi connection was ok to serve six devices simultaneously :) The garden is greener than in the pictures, you feel isolated from the street. Barbara is a great host keeping in touch with us all the months before we arrive and during the stay itself, helping with both ordinary and extraordinary issues. Ardea has a number of supermarkets, we enjoined Sisa at Via Livorno and also small pizzeria in front of it. It may be said without exaggeration that the villa presented us one of the strongest positive impression of the holidays; it is a perfect option to stay for 8-10 people. Hope someday we will smell this sea-floral scent again! Thank you so much! I'm glad you appreciate. You 've been the best guests than ever! Fantastic house, garden and patio! We had a great stay in Casale Torlonia, all 9 of us from the 1 year old to us 4 adults. Barbara and Allesio are the best hosts, always available to answer questions and help us in any way we need. The bedrooms are big and nice furnitured, the 3 bathrooms are really nice and the outdoor area is just fabulous. We will like to go back! I really appreciate your nice rewiew. You have been ecxellent guest too. Hope to meet you again.